Do you need refreshing new energies in your Project? Have you got the will power and the magic to develop new ideas ? New ideas are vital to promote the economy, keep investors happy and make sure you and your team enjoy every day. When individual minds come together in a lively creative atmosphere, they generate the energy to move forward on projects and stay ahead in the market. I host creative atmospheres and spark participants into activity and catalyze ideas from within groups. Groups of between two and ten are ideal. The results are yours. Say hello. As a hands-on Designer, I motivate people to design better tomorrows for themselves and those around them. 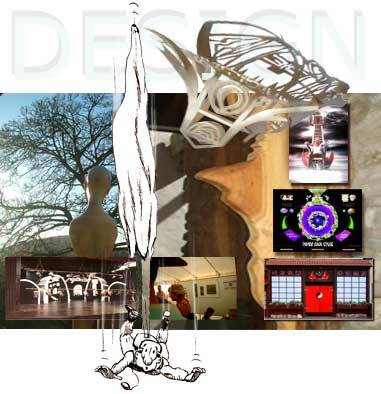 Being hands-on, my design folio is also full of interesting practical design solutions produced for people-projects. Whilst most projects remain private and personal, I am gradually uploading the bits that have become public and by clicking on the Gallery links below, you will find much to make you smile, wonder, laugh and ponder. Copyrights in designs appearing are the property of either the designer or client named in the respective caption and must not be reproduced without permission.